Srinagar, July 11, (Scoop News)- Governor N.N. Vohra visited Leh yesterday to review the progress of development works in the district. He was accompanied by his three Advisors, Chief Secretary and Principal Secretary Planning, Development and Monitoring Department. After arriving at Leh, Governor held a meeting with Sh. Thupstan Chhewang, MP; Sh. Chering Dorjay, MLC and former Minister; Sh. Nawang Rigzin Zora, MLA, and former Minister and representatives of political parties. The Legislators raised a number of issues and sought increased capital allocations for Leh district and, besides, accelerated completion of all long pending works. After meeting the Legislators the Governor, held extensive discussions with the Executive Councillors of LAHDC, all of whom raised demands for larger allocations and urgent completion of long pending works. 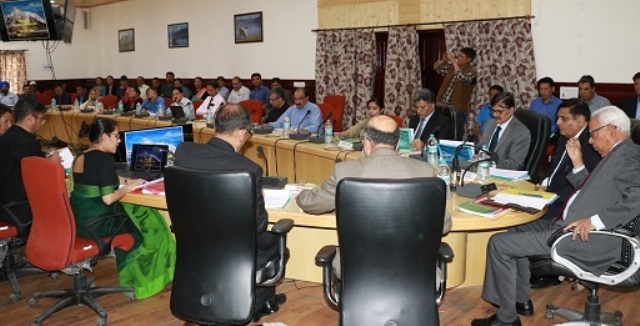 Thereafter, Governor chaired a meeting of District Officers of Leh District where the entire range of developmental issues of the district were discussed in detail. Ms. Avni Lavasa, District Development Commissioner, made a detailed presentation in which she highlighted the state of development works in the district, progress of ongoing schemes, impediments in the completion of works and other major issues pertaining to the district. Reviewing the progress of the roads and bridges sector, Governor emphasised the urgent need for expeditious completion of ongoing Central Sector Schemes, particularly those which had been ongoing for more than three years. He urged the engineers to not only ensure timely completion of Projects but also take due cognizance of the quality of the works being executed. Governor directed Principal Secretary Planning, Development and Monitoring Department to ensure that funds for transfer of utilities should be made available to the district on most urgent basis, before 25 July, 2018.